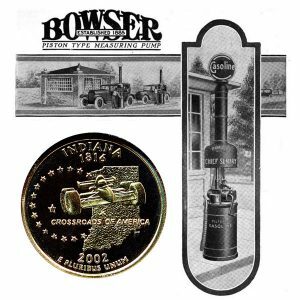 Today, the Indiana State Quarter Coin remembers when Sylvanus F. Bowser sold his first piston pump, the forerunner of today’s gasoline pumps, to Jake Gumpper on September 5, 1885. Jacob D. Gumpper has made a splendid record in connection with business affairs of broad scope and his activities have touched many and varied lines of enterprise during the course of his long and productive business career. He has maintained his residence in Fort Wayne for nearly forty years, was for nearly a score of years one of the most successful traveling salesmen for the Bowser Pump & Tank Company, which is one of the most important industrial and commercial concerns of Fort Wayne, and he is now retained as instructor of salesmen for this representative corporation. He is one of the well-known and highly esteemed citizens who specially merits recognition in this history. Jacob D. Gumpper gained his youthful education in the schools of his native town and as a lad of thirteen years initiated his association with the practical affairs of business by taking a position in a general store at East Brady’s Bend, Pennsylvania, where he remained thus engaged four years. For six years thereafter he was a traveling salesman for a Pittsburgh wholesale grocery house, which he thus represented through northeastern Pennsylvania. After retiring from this position he was for five years independently engaged in the general merchandise business at Carbon Center, Pennsylvania, and for five or six years thereafter was identified with the oil-producing industry in the Pennsylvania fields. He was connected with the Bradford District Oil Exchange in the old Keystone state during the period immediately prior to his removal to Fort Wayne, Indiana, where he established his residence in 1879 and where he was successfully established in the retail grocery business until 1897. It is specially worthy of record in this connection that he purchased for use in his store the first oil tank that was manufactured by S. F. Bowser, founder of the great manufacturing business that has since been developed from a modest nucleus. This purchase was made by Mr. Gumpper on September 5, 1885, and indicated his early appreciation of the value of the invention upon which has been built up the extensive business of the Bowser Company of the present day. In September, 1897, Mr. Gumpper sold his grocery business and became a traveling representative for the Bowser Company, the oil tanks and pumps of which he introduced into many different states of the Union. In this connection he made a splendid record as a salesman, and in his travels he visited nearly all states of the Union. A few years ago the milk maid separated cream from milk – by the gravity process of filling shallow pans, waiting several hours, then skimming off the cream. Today, centrifugal cream separators extract a far greater percentage of cream from milk in but a few moments. Before Bowser Piston-Type Measuring Pumps created a new standard for gasoline service, automobiles were supplied with fuel by the gravity process. The gasoline was drawn into measures and poured through a chamois lined funnel into the automobile reservoir. The chamois was supposed to extract water from the gasoline. It usually failed. There is a real necessity for extracting water from gasoline just before discharging it into the automobile reservoir, because gasoline accumulates water in any kind of a tank. You have seen steam in your kitchen strike a cold window pane, condense and form drops of water. In a less quantity all air contains moisture – on rainy days, lots of it. When gasoline is drawn from a storage tank by any process, a like volume of air is forced into the tank by atmospheric pressure. The air entering the tank goes through the same process as the steam on your kitchen window. Its moisture content is condensed, forms water and mixes with the gasoline. Modern automobile service demands the extraction of this water before the gasoline is discharged into the automobile reservoir. The Bowser centrifugal water separator, located on the discharge pipe of the pump, whirls the gasoline in a solid body at the rate of over 1000 revolutions a minute without agitation. Water, being heavier than gasoline, is separated by this whirling motion exactly as the milk is separated from cream. The water is trapped in the separator. After passing through a wire cloth strainer, the gasoline, pure, dry and full of power is discharged without exposure to the air directly into the car reservoir. This type of separator requires pump pressure to be effective, and is therefore not found on any gasoline vending device having a glass container with gravity discharge. It is an exclusive BOWSER feature. That is why Bowser Piston-Type Measuring Pumps for gasoline assure better carburetion, more power — more miles per gallon. 1. INCREASED SALES—Motorists patronize the filling station where they can get good service—and they know that a Bowser equipped station will give them good service. They know that a Bowser Pump will give them quickly every drop of gasoline or oil they pay for. They know that the patented Bowser Separator assures clean fuel of the highest power. Motorists have confidence in Bowser, as a result of our many years of service well rendered. Why don’t you cash in on this good will? 2. MORE PROFITS PER GALLON.—Bowser All Metal Pumps have absolutely stopped evaporation in the tank and in the faucet. There is no waste. Bowser eliminates spillage. With the Bowser Piston-Type Measuring Pump you know that you are getting neither too much or too little gasoline. You know what Bowser will do. Why take a chance? 3. SAVE TIME AND LABOR-Bowser means speed. Our high speed pump delivers twenty gallons per minute. Bowser double cog rack construction assures convenience and ease of operation. Your time is worth money. So is your customers’. Let Bowser save both. In 1885 S. F. Bowser made the first piston type measuring pump for oils. Since then, Bowser measuring pumps have been standard. In the many improvements that have been made to measuring pumps since 1885, Bowser has led—and still leads today. With its new line of visible measuring pumps Bowser meets every preference. 6—Gasoline and measuring scales show plainly during night service. 8—Drain back to rank conforms to all state laws. Thus, the Bowser Visible fully protects both buyer and seller of gasoline. For specific details covering complete visible pumps or visible attachments, filling stations and garages should write the nearest Bowser office now. S. F. Bowser & Company, Inc. The Indiana State Quarter Coin shows with an artist’s portrayal of a gas pump and service station, circa 1921.